French edition of the novel Oblomov. In the 1859 novel Oblomov by Russian author Ivan Goncharov, the eponymous nobleman of the title doesn’t bother getting out of bed until page 150. He doesn’t do a whole lot more after that, either. That a novel of such breathtaking inertia remains a Russian favourite proves that quality writing can carry you right along, even when there’s nowhere to go. Oblomov is a nobleman who passes his days daydreaming on a couch, “striving for repose in a dressing gown”. He’s a decent and generous fellow, but can’t seem to find a cause or even any enthusiasm for simple entertainments: “... nothing interested him and nothing worried him”. Incapable of making decisions or taking action (he’s often compared to Hamlet), Oblomov ends up losing the woman he loves to a more practical and energetic rival and friend. Such languid, fatalistic layabouts aren’t uncommon in nineteenth-century Russian literature, but Oblomov is their poster-boy, and just as relevant today. As BBC Radio put it when they adapted the novel in 2005, Oblomov is “a tragic-comic hero for a couch potato generation”. 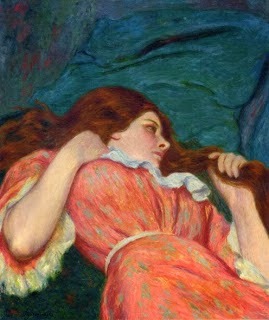 Languor by Federico Zandomeneghi, 1890. And so the Russian language gained the marvellous word oblomovshchina, which means more than just “laziness” or “indolence”, since it embodies a sort of reasoned futility. More precisely – and here’s where it can relate to travel and river cruising – it stands for the inertia and ennui that overcomes us when we’re in a far-off place. You’d think that someone who travels frequently could hardly be inflicted with oblomovshchina, but it’s actually all too easy to become jaded. Recently I was overcome with oblomovshchina in a Frankfurt hotel room at the end of a river cruise. I had so little enthusiasm for venturing out one night that I ended up dining on pot noodles and a Snickers from my mini-bar. Such moments make me feel guilty when I think that, for most people, even one such overseas trip would be the experience of a lifetime. 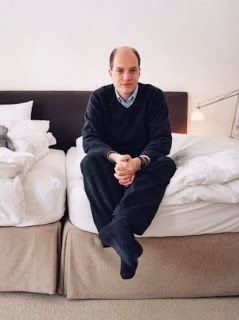 Swiss philosopher-writer Alain de Botton. However, I’m far from alone in struggling with oblomovshchina. Alain de Botton for one describes a similar moment of melancholy lethargy in Madrid in The Art of Travel, when he felt he ought to do a weekend’s sightseeing but actually couldn’t be bothered getting out of bed. Don’t we all indulge in this, sometimes for an entire holiday? Surely the tropical beach resort is the embodiment of oblomovshchina. You roll out of bed, you eat too much, you flop by the pool, you eat too much, you watch CNN, you roll back into bed. And so the holiday goes. Of course, few of us can afford to do nothing for our entire lives like a Russian aristocrat. These days, I reckon we get our oblomovshchina from four sources: reading, television, Internet and travel. Through these seductive forms of escapism we enter a passive state. None involves action, and only travel can provide any meaningful interaction, though it seldom does. Indolence has its time and place, but oblomovshchina is anathema to any good travel. “Indolence is a delightful but distressing state; we must be doing something to be happy,” as William Hazlitt so succinctly puts it. So next time I’m overcome, I need to remind myself of Oblomov, and force myself to action. 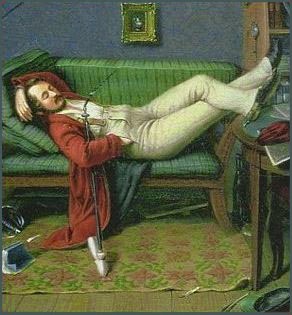 You mightn’t have read Oblomov, but you’ve almost certainly experienced oblomovshchina at some point in your life, so please leave a comment and join the conversation!